With the support of the Swedish Ministry of Foreign Affairs and the Swedish Embassy in The Hague, IDLO organized a seminar in Kampala for justice actors, governmental authorities and civil society to develop partnerships and build an increased commitment to addressing SGBV through rule of law reforms. IDLO and Swedish representatives presented key recommendations at the ICC Assembly of State Parties in November 2015. 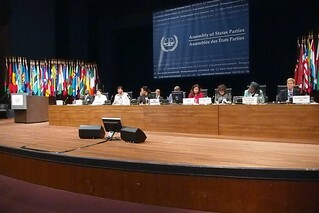 ICC: Panel Discussions on Complementarity. ​With silence, shame and stigma comes underreporting which shadows the true extent of the problem. It also prevents authorities from responding adequately. Statement: Ensuring access to justice for victims of sexual and gender-based crimes, delivered by Sweden’s Minister for Culture and Democracy, H.E. Ms. Alice Bah Kuhnke. Report: Bureau of Complementarity (including summaries of the proceedings of the IDLO Kampala workshops in annexe III).